I have been thinking about this for a year when I found some fantastic origami paper at Made in Japan in Melbourne. The paper was already cut into squares making it a lot easier to work with. 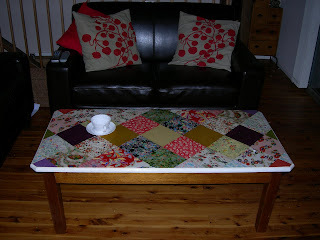 My other half actually made the table quite a few years ago and when we recently cut the legs off to serve as a coffee table I wanted to jazz up the top so that it didn't need a tablecloth. We stuck the paper on with PVA and then we applied four coats of floor estapol over the top. Looks great groover! V says she admired it the other day but in the quick cup of t time didnt get to mention it. so nice to se u tonight! !